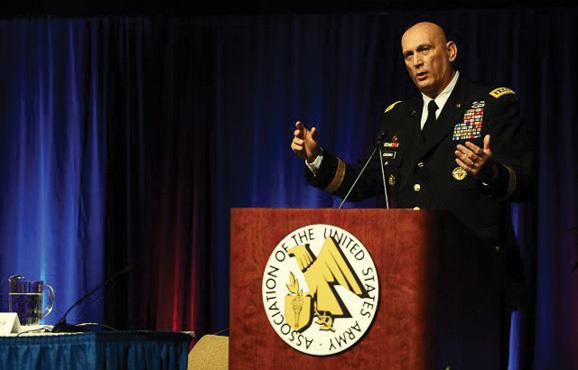 Gen. Ray Odierno, US Army Chief of Staff, addressed soldiers and industry representatives during the 2015 Association of the United States Army Global Force Symposium and Exposition in Huntsville, Alabama, 1 April. There, the General introduced the Army Operating Concept, (AOC) and its impact on force optimization and modernisation. Photo: Army Chief of Staff Gen. Ray Odierno discusses the Army Operating Concept. Odierno acknowledged the challenges of slashed budgets, but indicated how the AOC is designed to accomplish more with less. The AOC remains focused on the soldier and the squad. As such, Odierno said supporting AOC’s mission to “Win in a Complex World,” means the focus of future modernisation efforts will be on enhancing soldier’s lethality, protection and situational awareness. He added that mission control and command also needed to be improved and DoD will invest in new networking capabilities, including for expeditionary command posts. Specifically, he said that there is a need to reduce the Army’s command and control footprint, while at the same time allowing information to continue to flow unimpeded to soldiers on the move. Due to forced budget reductions Odierno said, the Army has cut 80,000 soldiers and has been reduced by 13 brigade combat teams. The Army has also had to cut three aviation brigades and modernisation programmes overall have been reduced 25%. Included among those modernisation cuts were the infantry fighting vehicle modernisation programme and the scout helicopter developmental programme. The General went on to discuss that these fiscal challenges not only impact force size, and modernisation efforts, but operational readiness. He said that right now, only 33% of U.S. brigades are ready to fight, when the number should be at least 70%.